Do you ever wish you could wave a magic wand and solve all your hubby’s problems in one magical swoop? I know I do. Even though I still haven’t found that magic wand, I have learned to collect tips and advice to add to my “how to cope with stress” toolkit so I can whip out that healing hammer whenever my husband is having a bad day. Give him space - When your husband has challenging days at work as often as mine does (his role requires frequent audits), you learn that some days he needs to talk and other days he just needs to turn on the Playstation and blow up some bad guys. Tell him, with words, that you are there for him and for anything he needs, then let him choose what would help the most. Focus on the Good – If he is in the mood to talk, after he vents and lets the day go, find things to celebrate – even if it’s chocolate chip cookies for dessert or his favorite show on TV that night. The little things that make us smile can go a long way to cheer us up. Remembering how much we have to be thankful for is always a good idea. Say Thank You – Thank him, for all his hard work and everything he does for you so that you can have a home together. Gratitude is a powerful force and when you shower it upon your husband, it has the power to instantly lift his mood and make him feel like the king of the world. And we all know hubbies love that, right? Make him laugh – Don’t worry, you don’t have to be a comedian to do this, you can watch his favorite comedy on TV or funny videos on YouTube. For any Seinfeld fans, there is a hilarious guy on Twitter who writes tweets as if Seinfeld was still on the air. He tweets things like: “George tries to hide that despite seeing every episode he has no idea what’s happening on Game of Thrones. Elaine buys defective yoga pants.” You can find him here. Touch Him – Hold his hand, hug him tight, squeeze his knee when you are watching TV. Whatever way he likes to be touched – use the power of touch to connect and soothe. If he asks, “Why are you touching me so much?” Tell him you just read an article (yes, this one!) that said the University of Illinois studied NBA basketball teams and found that the more on-court touching there was early in the season, the higher the teams scored by the end of the season. If it works for the NBA, it works for the Wifey in my book! Flirt – Remember how he loves to feel like he is the king of the world? Well that’s not exactly true. What your husband loves is to feel like he is the king of *your* world. Flirting is the most direct, most fun way to convey that to him. It’s also a way you get to have fun, make him laugh and touch him at the same time. It’s a triple whammy of deliciousness. In fact, you should do that even when he’s not having a bad day, don’t you think? 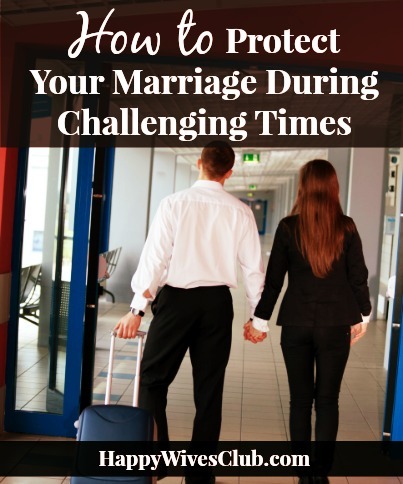 Just listen – Okay, ladies, this may seem obvious but I know there are a lot of you like me out there, looking for magic wands to wave and problems to fix when all our husbands need is just our love and listening ear. No matter how tempted you may be to find 5 potential solutions to his problems, stop, look at his beautiful eyes, focus and just listen. 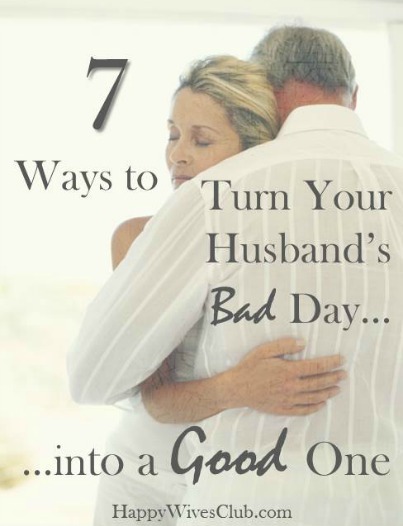 QUESTION – These are 7 of my favorite ways to help my hubby on those stressful days. 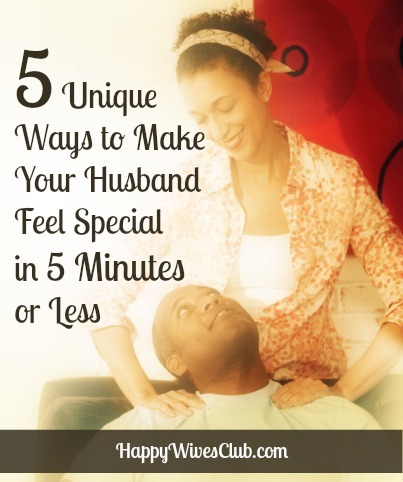 What do you do to help your husband cope with stress? Please share your tips in the comments. 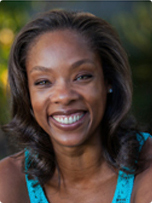 Maggie Reyes is a Life Coach, Writer + the Founder of ModernMarried.com. 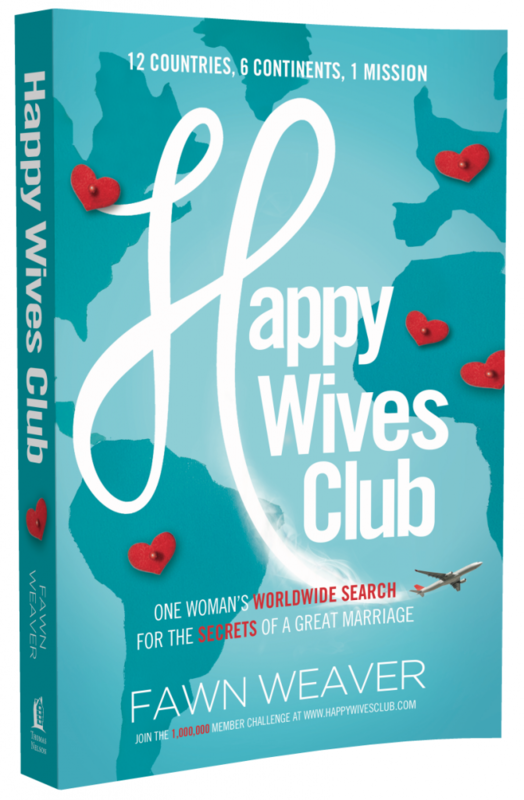 Her romantic-yet-practical approach to wedded bliss has been featured on Project Happily Ever After, Daybreak USA, Cristina XMRadio and Military Spouse Magazine. When she’s not writing, working or creating pins for her fabulous Facebook Community, you can find her cuddling with her hubby, reading a romance novel or embracing how the words “over-achiever” and “TV Junkie” can still go in the same sentence, to describe the same person. 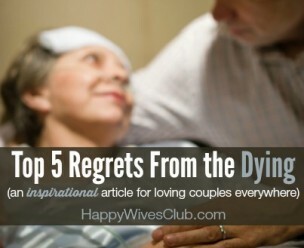 Learn how to love like a newlywed no matter how long you have been married at ModernMarried.com.